Fabio Cannavaro, Cavaliere OMRI (born September 13, 1973) is an Italian FIFA World Cup-winning footballer and captain of Italy who currently plays for Juventus Turin. If Rio Ferdinand is worth £120,000 a week, Cannavaro is worth a hundred million a day. Fabio being the first player presented has a special symbolic meaning, being that he is true number one with great leadership skills. We are convinced he will be a role model to help build a winning team. Upon arriving in Madrid, Cannavaro's first words demonstrated his pride, happiness, and satisfaction for joining such an admired Club. Cannavaro is having a fantastic World Cup. He is without question the strongest defender at this tournament and the absolute number one in the world. 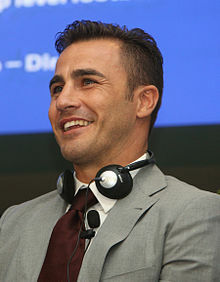 Fabio Cannavaro was the best player of this World Cup. I would have married Fabio anyway, no matter what was his job or where. It doesn't matter that he is a world known footballer. I love him because of his essence as a human being. Talking about Fabio's height is the same as talking about the fog in Milan.I have never felt that he is short when I play with him,because he can jump higher than anybody else. He is always good at heading. It doesn't make any sense talking about Cannavaro like that. Cannavaro has that unmistakable presence as a leader and in my impression, is exactly like that tough and cool-headed defense he shows on the pitch. I can't choose just one! Real Madrid only has great players. Raul, David Beckham, Ruud van Nistelrooy, Ronaldo... The one that impressed me the most after having actually played together is Cannavaro. He's sturdy and lithe and his attitude when he faces a match is exceptional too. I think he's the best center-back in the world. This page was last edited on 30 December 2018, at 17:58.